Since the 18th century, the maple leaf has been the symbol of Canada. Reason enough for the Royal Canadian Mint to commemorate the country's national symbol with this unique 1 ounce Maple Leaf Reflection coin with a fine silver content of 999.9/1000. For the first time, traditional engraving techniques have been combined with modern micro engraving and laser etching. 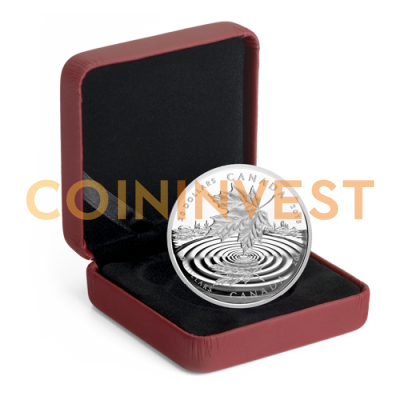 With only 8,500 copies, not only is the coin an extraordinary collectors' piece but also an excellent investment with the best potential for a profitable price increase. The front of the coin captures the fleeting moment in which the tip of a maple leaf touches the surface of the water in a lake. The particularly complex engraving work mirroring the leaf can be seen in the rippling water. The reverse side of the coin bears the profile of Queen Elizabeth II, Canada's official Head of State. This, along with the inscription, identifies the coin as legal tender in the amount of 20 Canadian dollars. 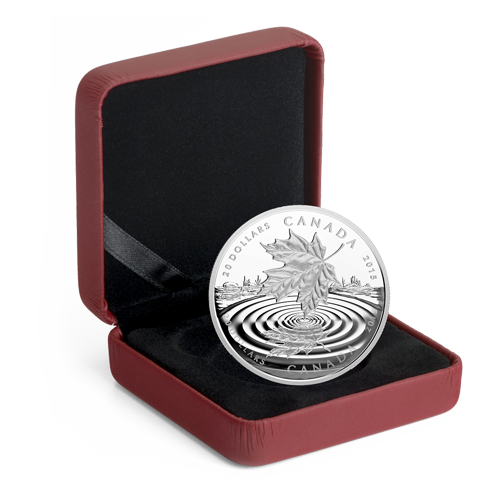 The 1 ounce Maple Leaf reflection is delivered in a wine-coloured padded box embossed by the Royal Canadian Mint, which is equally suitable for both storage and presentation.